The Diaries of a Glam Mama: Why do I cloth diaper? Why do I cloth diaper? There has been much ado about my choice to cloth diaper my kids. I've had to field weird questions and surprisingly ignorant remarks from many people, although now that I've found many other parents who share the same passion (some of whom I helped convert to cloth diapers ;p), I've found that I've needed to explain myself a lot less. That being said, I hope this post helps to educate at least one more person about why I, as a mother, have chosen to cloth diaper my children. 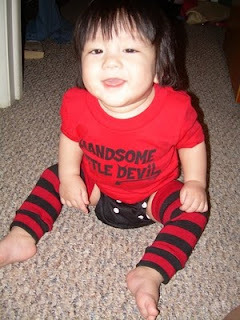 A little background on how I came to know about cloth diapers. My brother & I were fully cloth-diapered when we were babies. The only reason, according to my mother, was financial constraints. So I grew up knowing that I was in cloth once all those years ago. When I was pregnant with Aqil in the US, my mom sent over a box of baby stuff - including old-fashion flat cloth diapers (also known as lampin in Malay). When she came over a few months later, she showed me how to fold them...and I promptly informed her that it takes too much time, I'm lazy and I will just use disposable diapers. Come August 10, 2007, I became a mother. Between a difficult start to breastfeeding and my baby's short stay in the NICU, I could not be bothered to think about researching diapering options. 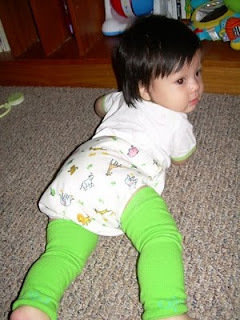 As far as I knew, the flat diapers are cloth diapers, and all other diapers were disposable. Boy, was I ignorant! Cut to four months later. My kid was having to endure frequent diaper rashes, despite my strict 2-hour rule (baby must be changed every two hours and cannot be allowed to stay in a diaper for any longer than that). Add to that the huge expense that we incurred from the use of high-end disposable diapers, and the amount of trash we had to throw out every single day. I knew there had to be a better way! Coincidentally at this time I was active on the TBW forum. Many of the mamas on there practiced other natural parenting techniques, including cloth diapers. I couldn't fathom why these mothers would put themselves through the inconvenience of folding flat diapers at every change...so I started doing some research. I was so surprised by the huge range of options when it comes to cloth diapers. Prefolds, pockets, all-in-ones, wool covers, PUL covers...my oh my! After a week of researching, I ended up getting more and more confused. So I turned to my friend, Jess, for some clarity. To this day, I credit her for converting me to use cloth diapers :) So around the time Aqil was 5 months old, he was in cloth diapers. Afraz started as soon as he got back from the hospital, at three days old. So why do I use cloth diapers? I am no longer literally throwing my money in the trash bin. If I were to calculate the price-per-use of my cloth diapers (which gets LOWER with every use) versus the price-per-unit of disposable diapers (which always stays the same), the clear winner would be cloth! CLICK HERE for a basic comparison of dispos VS cloth in terms of $$$, and CLICK HERE for a personalized calculation for dispos VS cloth. 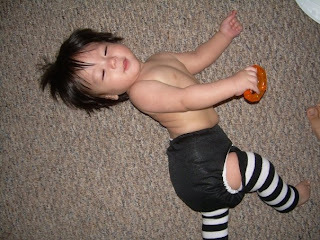 I've noticed that the frequency of diaper rashes in my kids are much less when wearing cloth diapers. 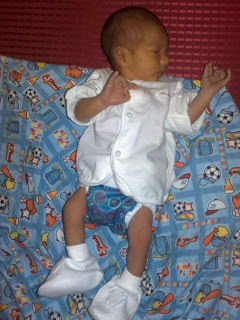 I change them every 2-3 hours no matter what diaper they are wearing, so there's no difference there. I admit that this might have something to do with their sensitive skin, as opposed to the inferiority of dispos, but its one of the main reasons I stick to cloth. On a similar note, I think that cloth diapers are more comfortable against my kids' bottoms that disposables. There are a few reasons for this. I used to use disposable pads during menstruation. For that one week that I am menstruating, I have to put up with major discomfort on my va-jay-jay - disposable pads caused rashes, made me feel hot (in a bad way) and always felt scratchy, no matter what brand I tried. So the thought of putting my kid in disposable diapers always brought back memories of that, and they have to put up with it for much longer than I do - I can't imagine going 24/7/365 for 2-3yrs with that feeling. YUCK! Also, Aqil is old enough to tell me that he finds dispos really uncomfortable. And apparently it gives him wedgies (which happened to me too). It really is better for the environment. Ever since I became a mother, this saying has held a lot of importance to me and has become a profound influence on my life: "We do not inherit the Earth from our ancestors; we borrow it from our children". I'd like to do my best to make sure that my children and grandchildren don't end up living amongst landfills full off feces- and urine-filled disposable diapers that they had themselves used as babies. I don't have to worry about running out of diapers. If I see my "inventory" is low, I just wash a few diapers and I'm ready to go. When I had a dryer, it was even easier because I knew that within an hour (half hour to wash, half hour to dry), my kid would have diapers to use. No need to go out in the middle of the night and/or during a blizzard or a thunderstorm to find diapers at the supermarket only to find out they've run out of stock for your kid's size! Plus I use mostly one-size diapers (that can be used from newborn-to-toddlerhood), which means I never have to worry about wasting unused diapers when my kids get bigger and move up a size (I had to give away a whole carton of newborn-sized disposable diapers because Aqil grew out of them so quickly and I didn't get to use them). Using one-size diapers means my kids can share diapers. Having two babies in diapers could've done a lot to my wallet, but since they are both in cloth diapers AND they share most of their diapers, I've saved a lot of money. adrin,cmne nk yakin kn hubby bout cloth diapers nih?nk sgt tkr ke cloth diapers.if kiter ckp psl cloth diapers je,dia ckp sm je..geram tul..kiter pk xnk membazir just like u said in this blog post.semua nk yg terbaik for both parties.am i right?hu..so sad..hel please!! kak ayu, apa sebenarnya sebab2 dia tak nak guna cloth diaper? sebab takut leceh ke, busuk ke, mahal ke? if i know the reason for his apprehensiveness, maybe i can recommend how to convince him to use cloth diapers..
adrin, can u suggest me which cd is the best to start? i mean, i have no clue at all. am thinking of using cd. but slowly sbb this newborn is coming out. so i takut i takde masa nk cuci and at the same time nak handle a toddler n a newborn.